Whether you know it or not, all of us depend on pollinators to help produce many of the fruits, vegetables, and nuts that enrich our diets. Although most people think of honey bees when they hear “pollinators,” many insects and other animals pollinate flowers, including mason bees, bumble bees, flies, moths, butterflies, and hummingbirds. All of these animals serve an important function as pollinators. They all visit flowers to feed on pollen or nectar. In the process, pollinators move pollen from one flower to another, eventually helping the flower produce seed and fruit (Figure 1). This pollination process is central to the well-being of the agricultural and natural ecosystems that sustain us. Figure 1. Pollinators fertilize plant flowers by carrying pollen from the flower’s stamen (the male reproductive structure) to the pistil (female reproductive structure). 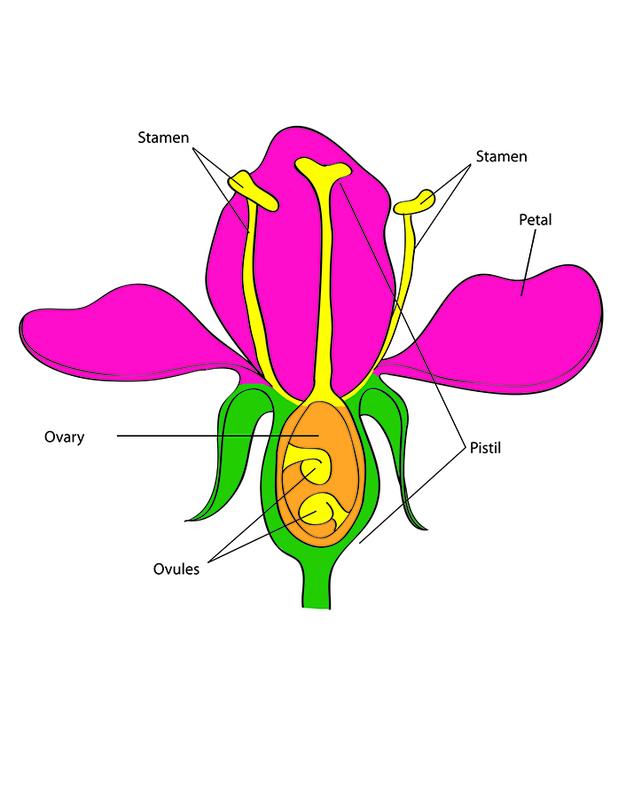 The pollen moves down the pistil and ultimately fertilizes the ovule, which produces the fruit and seed. 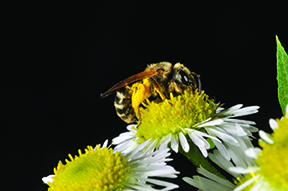 Today, honey bees and other pollinators face a number of stresses that are reducing their numbers. Some of these stresses include loss of suitable habitat, various diseases, Varroa mites, and pesticide exposure. Many of the pesticides that protect turf and ornamental plants from insects and diseases can kill pollinators when applied to actively flowering plants. It should not be surprising that a flower treated with an insecticide can kill pollinators that contact it. But the problem with insecticides can be more wide-ranging. Some insecticides not only kill insects on contact, the plants can also take up the insecticide and distribute the chemical throughout its plant tissues. These “systemic” insecticides include neonicotinoids, the most widely used group. Although as a homeowner you may not be able to counter all of the factors that threaten pollinators, you can minimize the potential negative effects of your insecticide use. To understand the risks that insecticide use poses to pollinators, it is important to understand the concepts of toxicity and exposure. Toxicity describes the amount of an insecticide required to kill an organism. We often measure toxicity as the amount of active ingredient that is likely to kill half of the organisms that encounter it in a laboratory setting. This threshold is called the LD50 (or, Lethal Dose, 50 percent). Exposure, on the other hand, refers to the amount of insecticide that each organism actually receives. 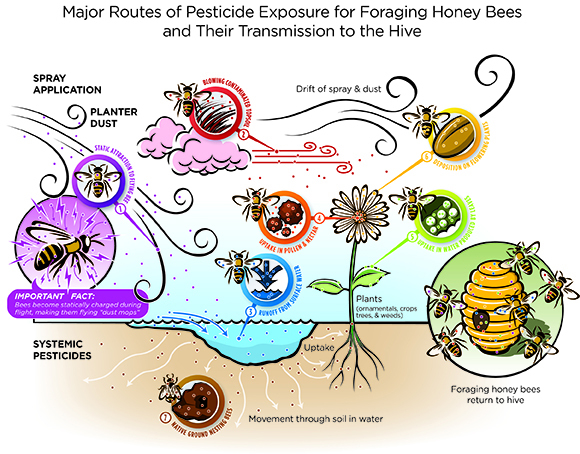 Due to the complex behavior of pollinators and the many ways and combinations people can apply insecticides, it is far more difficult to predict pollinator exposure to a particular insecticide (Figure 2). Here’s a good example that illustrates toxicity and exposure. The active ingredient in household bleach (sodium hypochlorite) is toxic to humans. However, humans usually limit their exposure by using gloves or by diluting the bleach with water. At extremely low concentrations, the same chemical is even considered safe to drink when municipal water systems use it to protect the public against waterborne pathogens. You can make similar generalizations about insecticides. The potential risk of an insecticide is greatest when the insecticide is toxic to pollinators, the insecticide is present in plants for an extended period, and the insecticide is located in or on the plant parts pollinators are likely to visit. For example, homeowners may make an early-season soil application of a systemic insecticide (such as imidacloprid) under a linden tree to kill aphids that feed on the leaves. However, this same application may be hazardous to pollinators, because linden flowers are attractive to many pollinators, and an early-season application could result in the insecticide remaining in the flowers and other plant parts for the entire season. In contrast, applying a foliar spray of insecticidal soap will kill aphids and pose much less of a risk to pollinators, because it has a lower toxicity to bees. And if you wait to apply the insecticidal soap until after all the flowers have fallen off the tree, you would reduce the risk to pollinators even more. If the tree has no flowers, bees have no reason to visit them, thereby reducing their possible exposure. It’s also important to note that pesticides are not always the most effective long-term tool to protect plants from problem pests. Selecting plants that are genetically resistant to insects and mites can keep pests from reaching damaging levels. 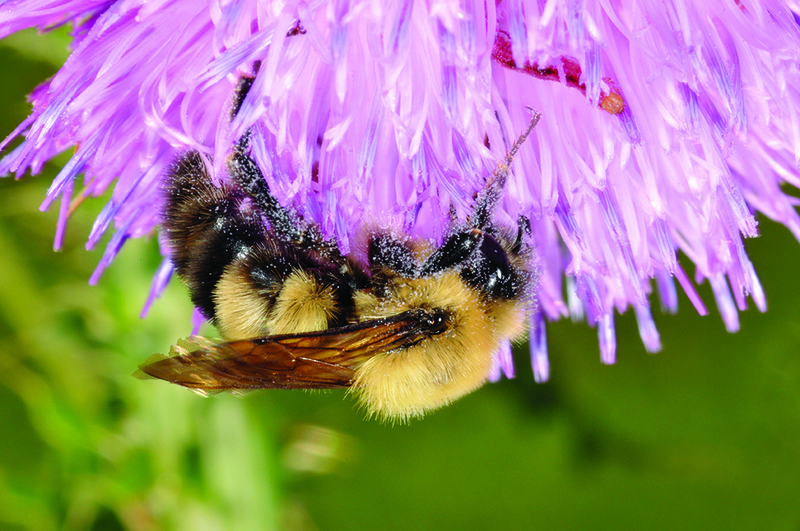 Refraining from pesticide use and planting resistant species can keep pollinators safe and attract beneficial insects that can attack and kill pests. 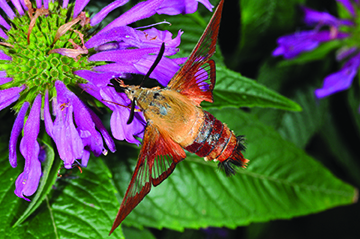 You can learn to recognize many of these good insects with the Purdue Plant Doctor Apps (purdueplantdoctor.com). You can take steps to help minimize the potential negative effects of insecticides on pollinators and other beneficial insects. Here are six practices that can help. Insecticide labels contain specific instructions to help you reduce risks. The labels commonly require you to wear protective equipment and avoid bird baths, ponds, streams, and toys. Recently, some labels have added special bee icons to warn users about certain uses that can be especially toxic to bees (Figure 3). Figure 3. Look for bee advisory boxes on pesticide labels and follow all directions to protect bees. People often apply insecticides in ornamental plants and lawns preventatively, when no pests are present. Although there are many kinds of insects in the lawn and landscape, only a few are known to cause problems. The rest (including pollinators and other beneficial insects that feed on pests) are helpful or harmless. Be sure the insect you spray is actually a pest and present in large enough numbers to harm the plant. 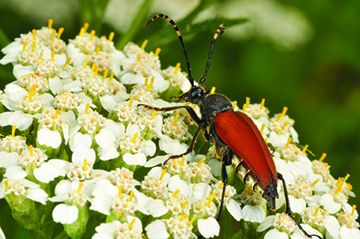 Use resources like the Purdue Plant Doctor Apps (purdueplantdoctor.com) and Purdue Extension publications (edustore.purdue.edu) to identify pests and select the control methods. You may also contact your local extension educator (in Indiana, find your Purdue Extension office at extension.purdue.edu/pages/CountyOffices.aspx or 765-494-8491). Spraying “just in case” is not necessary or helpful. Pollinators forage for nectar and pollen on a wide range of flowering plants (Figure 4), including some of the most common weeds in turfgrass. If you do apply pesticides, keep them away from areas where pollinators are likely to visit and feed. Figure 4. Many different pollinators visit a wide variety of flowering plants. These photos show a hummingbird clearwing moth, a flower longhorn beetle, a mining bee, a bee fly, and a soldier beetle. Never apply insecticides directly to the blooms of flowering plants. 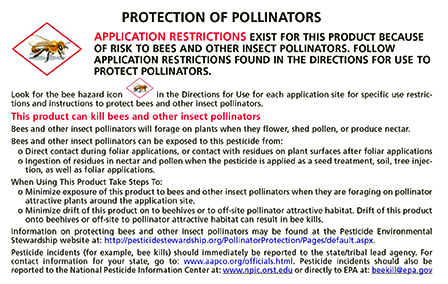 Pollinators are focused on blooms, so most insecticide labels expressly prohibit applications to these plants parts. Figure 5. 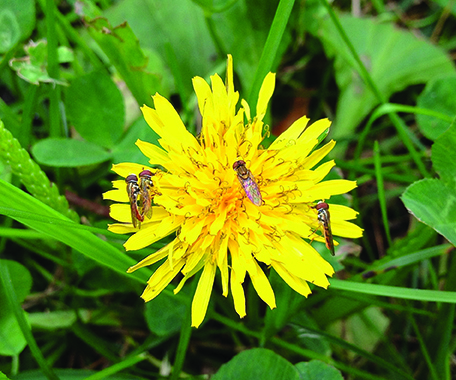 Common weeds like dandelions are highly attractive to pollinating insects like these hover flies. Figure 6. 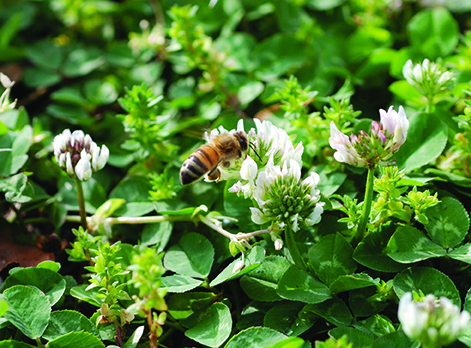 White clover is a common weed that attracts honey bees. Figure 7. 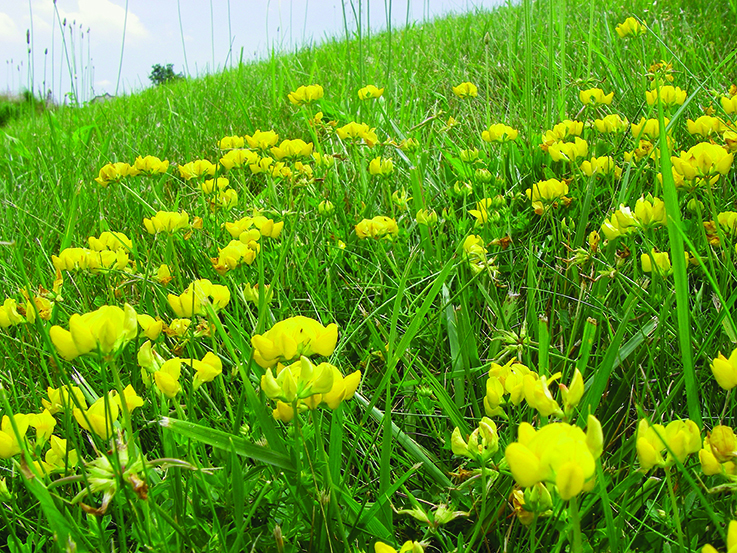 Birdsfoot trefoil is a common weed in low-maintenance turfgrass that attracts pollinators. 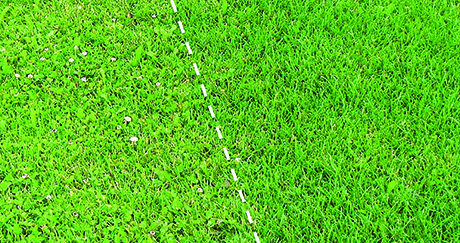 Maintain a relatively weed-free lawn to make your lawn less attractive to pollinators that pollinate flowering weeds (Figure 8). Figure 8. Before applying insecticides, make sure to remove all weeds first. 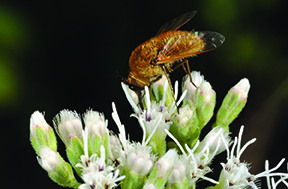 Pollinators may be attracted to flowering weeds. Mow the turf immediately before spraying any insecticide (Figure 9). 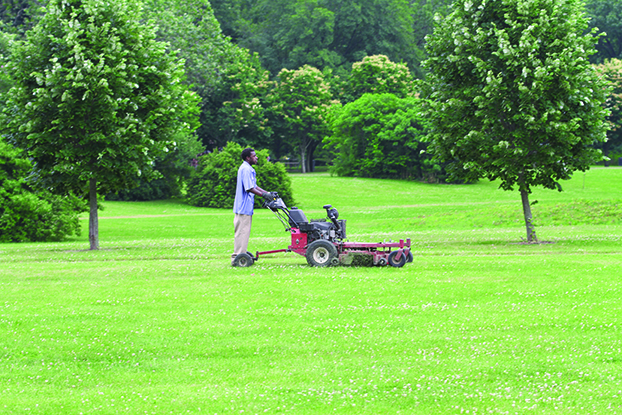 Regular mowing will significantly reduce the number of flowers and reduce pollinator foraging. If you use neonicotinoids, mow frequently enough to keep these blooms from returning, because plants may take up neonicotinoids from the soil and move them throughout the plant for an extended period. Figure 9. Mow to reduce the number of flowers before you apply insecticides to turf. We don’t currently know if neonicotinoids and other systemic insecticides can persist in the soil after a year and move into the flowers of trees and other ornamental plants. If you have a flowering tree with an insect pest problem, avoid using neonicotinoids and other systemic insecticides, especially when other options are available. Home landscapes usually have large lawns with landscape beds throughout. These beds often contain flowering plants that attract a variety of pollinators and other beneficial insects. Although the boundaries between your landscape beds and turf are usually well-defined above ground, the intermingling of plant roots may create a much softer boundary in the soil. So if you apply systemic neonicotinoid insecticides to the turf, adjacent flowering plants could inadvertently take up the insecticide, too. 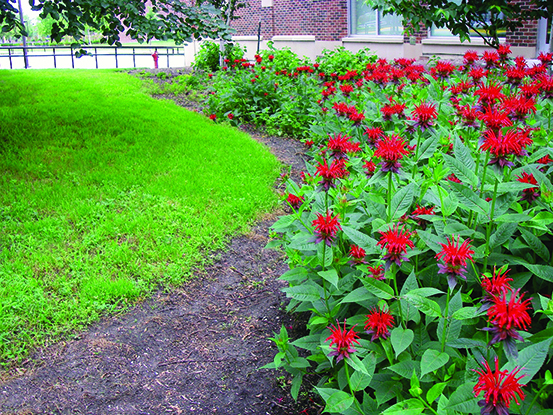 To protect pollinators, leave a buffer strip of 2-3 feet between treated turf and the border of any landscape bed. This will minimize the potential for flowering ornamental roots to take up neonicotinoid insecticides. Use alternatives to neonicotinoids when possible (Figure 10). Figure 10. Maintain buffer strips to reduce the potential movement of turf insecticides into flowering beds. There are many time-tested alternatives to systemic neonicotinoids against common turf and ornamental pests. 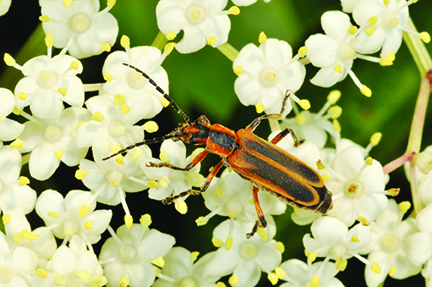 For turf, you can find many alternatives in Turfgrass Insects: Protecting Pollinators from Insecticide Applications in Turfgrass (Purdue Extension publication E-267-W), available from the Education Store, edustore.purdue.edu. The Purdue Plant Doctor app series (purdueplantdoctor.com) also lists alternatives available for common ornamental pests. All photos were provided by and are the property of the authors except Figure 4 by John Obermeyer; Figures 5 and 6 by Aaron Patton. All illustrations by Purdue Extension.